Roof dweller, Joo Seung is burying a large suitcase in the middle of the woods. Initially, it appears that he has killed his nosy, elderly neighbour, Jeom Yi after she discovered his stash of cash. It turns out that he has chosen to bury his money instead. 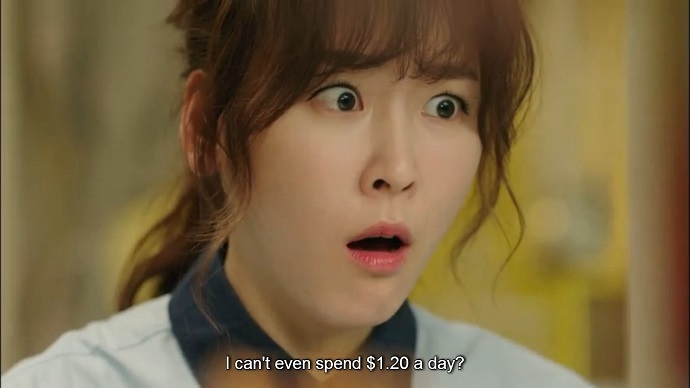 In contrast, writer Soo Ji has only $17.62 to live on until her next pay cheque in 15 days, forcing her to choose between food and bus fare. She figures out that she can commute to work using the bike that helped place her in this dire financial situation. However, when secret tenant, Hye Rim proposes going out for Thai food that evening, Soo Ji must bow out. Hye Rim is joined at the Thai restaurant by Joo Seung, and her other neighbour, insurance salesman, Dae Young. 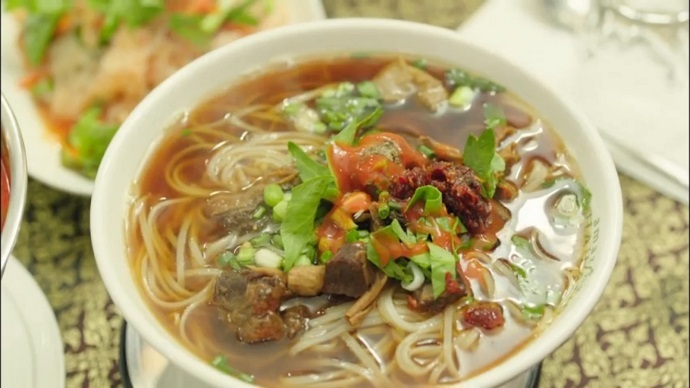 It turns out that Joo Seung has never had Thai food before. 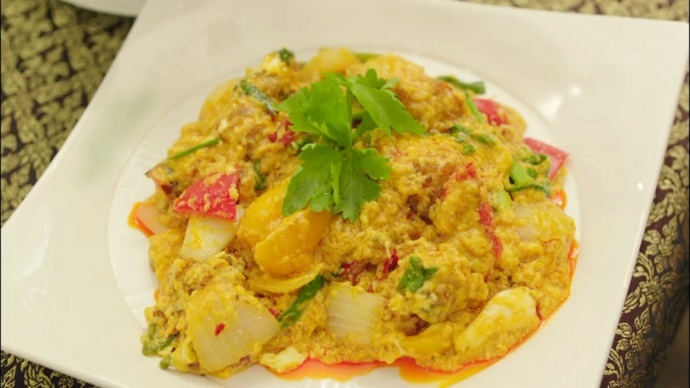 When he complains about the strong smell, Dae Young launches into one of his food lectures. Joo Seung eventually tries an unfamiliar dish, and ends up eating orgasmically like his dining companions. Outside the restaurant, Joo Seung comes up behind Hye Rim and Dae Young just in time to overhear her preference for men in suits. He is suddenly dissatisfied with his clothing. Civil servant, In Ah comes home to her estranged husband, and seems relieved to have him back. However, In Ah’s husband has only come home to present photographs of her leaving a hotel with Taek Soo, Dae Young’s colleague. In Ah produces her own stack of photographs of her husband with multiple women, and refuses to divorce, choosing instead to endure an unhappy marriage. Alone in her car, In Ah cries as she erases Taek Soo from her contacts list. Meanwhile, a drunken Taek Soo calls his daughter pleading for five minutes of her time to talk. The next day, Soo Ji rides her bike to work, goes to the nearby library to clean up and change clothes then stores her commuter clothing in a locker. She is super pleased with herself when she runs into her boyfriend, Sang Woo in the elevator. He asks if she has a shellfish allergy. 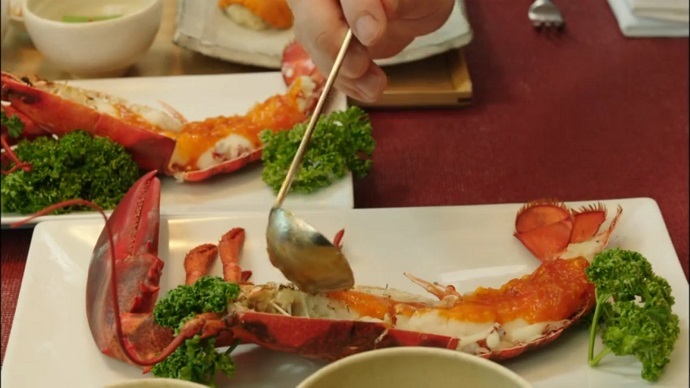 It turns out that Sang Woo is taking Soo Ji out for lobster dinner. 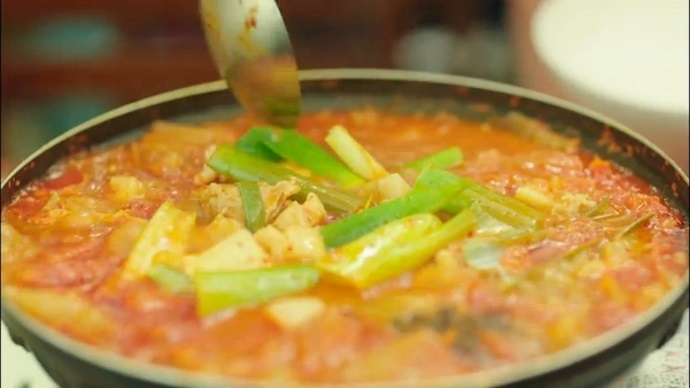 Soo Ji is so preoccupied with the possible price tag of the dish that she has no appetite. 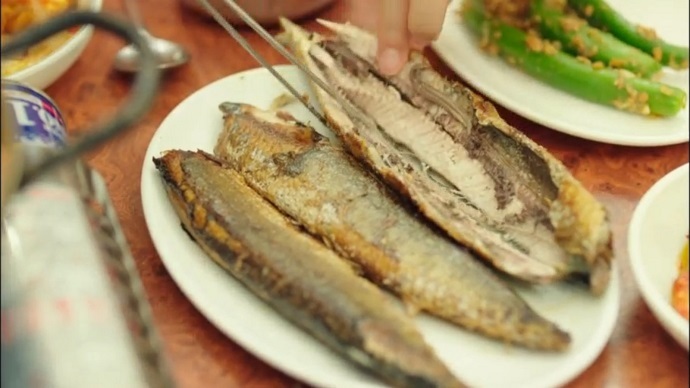 She eventually eats with Sang Woo’s prompting, but later suffers indigestion, which she has never experienced before. Since she cannot afford to buy drugs to treat her indigestion, Soo Ji asks Dae Young to borrow some. He does not have any, but ends up using a traditional Korean technique to relieve her symptoms. Later that night, Hye Rim unnerves Soo Ji by recognizing that the necklace Sang Woo gave her is expensive. Hye Rim shows some good sense when she advises a frazzled Soo Ji to simply be grateful, then questions whether Soo Ji is really dating if she feels so burdened by the gift. Joo Seung shows up, dirty from retrieving some of his money, and Hye Rim takes the opportunity to demonstrate to Soo Ji how to express gratitude without reservation. Soo Ji is still stressing about having to return the favour of treating Sang Woo to a meal when she remembers the seaweed that served as her payment for a job. She decides to make economical kimbap for lunch and dinner with Sang Woo. The next morning, Soo Ji wakes Dae Young up and stuffs kimbap in his mouth. When he deems it tasty, she is ecstatic. The food may taste good, but Soo Ji cannot roll the seaweed without breaking it. 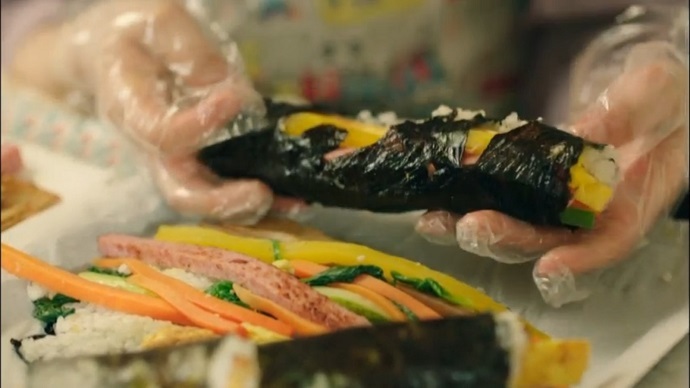 Dae Young demonstrates perfect technique for rolling kimbap. Soo Ji is taken aback when Dae Young blows her hair aside then picks some stray rice from her forehead. The routine of biking, cleaning, changing then storing her clothes in a locker has already become tiresome for Soo Ji. As she is entering the government building, Soo Ji is stopped by the security guard who informs her that her lunch box is forbidden. Soo Ji decides to smuggle her lunch box in the backpack containing her commuter clothes. Soo Ji is in the elevator with other employees including Sang Woo when the security guard apprehends her. It turns out that the security cameras caught Soo Ji stuffing the contraband lunch box in her backpack. The security guard is questioning her security access to the building when Sang Woo walks in, and puts a stop to the interrogation. Sang Woo uses salty language to refer to the security guard then reiterates how much he enjoys the interesting things that happen with Soo Ji around. He then excitedly eats from her lunch box only to discover that it spoiled in the heat. When Sang Woo hears that Dae Young had sampled the kimbap, he forces one down. To express his gratitude, Sang Woo proposes steak dinner, putting Soo Ji on edge. With Hye Rim in mind, Joo Seung asks Dae Young where he buys his snappy clothes, and Dae Young ends up taking him shopping for a suit. Time for a fitting room montage to the sounds of “Something Stupid”! Dae Young even manages to style Joo Seung’s hair with some product, and the sullen Joo Seung must admit that Dae Young is a cool hyung. After lunch, Soo Ji comes across In Ah trying to schedule continual distractions from her troubles. Sang Woo arrives after a sufficient amount of time behind Soo Ji, and In Ah relays the latest gossip about someone bringing a bomb into the building and being apprehended by the police. Sang Woo must stifle his laughter. In Ah accuses an embarrassed Soo Ji of being the terrorist then turns her accusation into a joke at Soo Ji’s expense. Jeom Yi is nagging Hye Rim when her land lady, Mi Ran comes to collect payment for the water bill. Hye Rim hides in the washroom while Mi Ran complains about increased water usage in the building. She suspects that Joo Seung of living with a girl then storms into his shed to find evidence. An alarmed Jeom Yi follows, and is relieved to find the money under the mattress gone. However, she does find Joo Seung’s ID with another man’s photo, which she hides from Mi Ran. When Joo Seung returns, he notices that his ID card is out of place, but thinks nothing of it. In a desperate bid to make money, Soo Ji decides to sell her tent online, just as she had with her treadmill. When she meets with a prospective buyer, the man attempts to sexually assault her. Soo Ji manages to fight back, but after the man has escaped, she bawls and calls Dae Young. At the police station, Dae Young shouts at an indifferent policeman while a shell shocked Soo Ji watches. Afterwards, a frustrated Dae Young rebukes Soo Ji until she simply says that she is hungry. 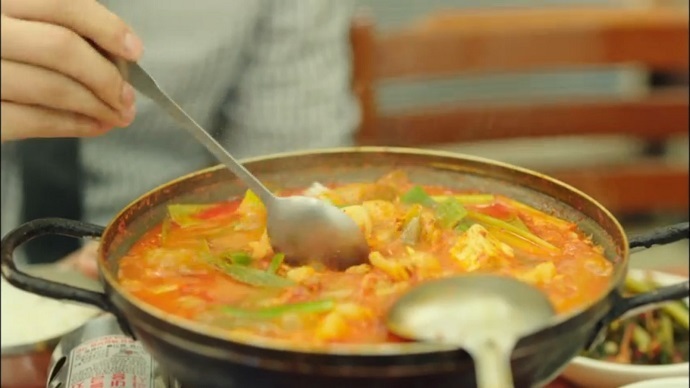 Dae Young takes her for some classic comfort food, kimchi jjigae, then cheers her up by imitating her. Soo Ji eats the pain away followed by drinking the pain away with soju. Soo Ji asks Dae Young what he likes about his girlfriend. With Soo Ji in mind, he says being with her is fun and comfortable. An envious Soo Ji reveals that she does not feel comfortable with Sang Woo; her inferiority complex is getting in the way of yet another relationship. Dae Young lists all the positive qualities he sees in her, concluding with the statement that she is more than worthy of being loved. Soo Ji appears deeply touched by Dae Young’s words, but blames the soju for her flush, and leaves Dae Young alone at the table. There were multiple times during this episode when I shouted, “Are you kidding me? !” at the screen. The worst incidence of this was the security guard stopping Soo Ji from bringing food into the government building. It seems like a ridiculous rule and impossible to police considering coffee breaks and office parties exist. Then, I was flabbergasted that Soo Ji’s food spoiled by lunch hour. I have never known food to spoil within a few hours, especially not kimbap, even in the middle of summer, unless the ingredients were spoiling already. In which case, was Dae Young to blame for allowing Soo Ji to feed Sang Woo spoiled food? The only good thing about these confounding developments is that they made Sang Woo look amazing. He saved Soo Ji from the security guard with authority and minimal fuss, then put her at ease by swearing, and making it clear that he finds the drama that follows her delightful. Then, Sang Woo reschedules the work meeting in order to enjoy lunch out in the open with Soo Ji, forces spoiled food down his throat in order to show his appreciation for her efforts, then mimes doing exactly that to Soo Ji during the meeting. It is too bad that Soo Ji is so uncomfortable around Sang Woo, because that will be the only reason for their breakup. Overall, this was a good episode. Aside from the cute interactions between Sang Woo and Soo Ji, my next favourite couple was Dae Young and Joo Seung at the clothing store. The only pairing that I still do not understand is Dae Young and Soo Ji. Dae Young says that he finds being with Soo Ji comfortable, and Soo Ji probably feels the same way. I just don’t think comfortable means that they should be together romantically, especially when there is zero chemistry. 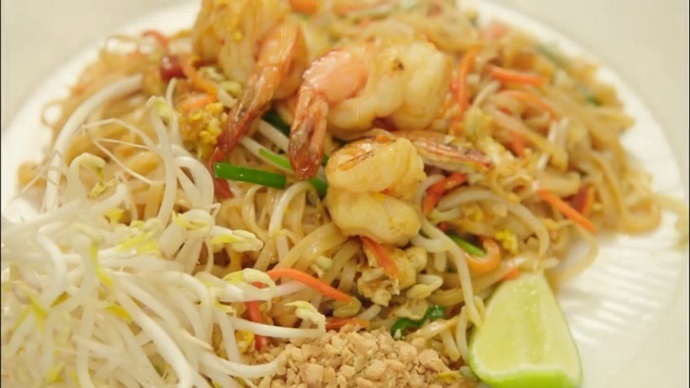 I definitely agree with Dae Young about one thing: Thai food really is loved the world over. Thank you for reading and commenting! 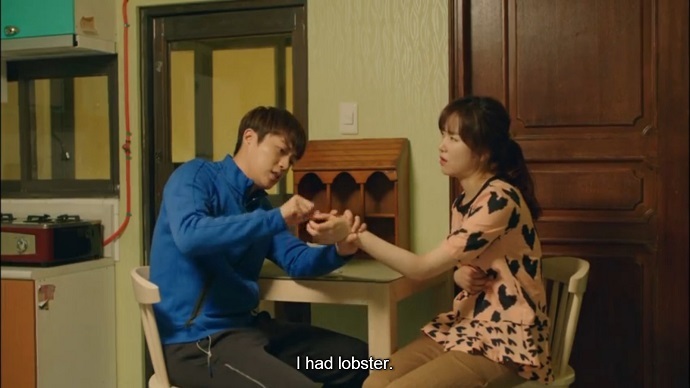 I was impressed with the acting of Yoon Doo Joon and Seo Hyun Jin in the final scene. They poured a lot of genuine emotion into their characters, and made them the most dignified they’ve been this entire series. However, I still do not see romantic potential; instead, I see the strong emotions and love between two friends. Seriously! I failed to mention in my comments that one “Are you kidding me? !” moment was in regards to how sweaty Soo Ji was at the end of her bike ride, and the whole clothing change hurdle. As someone who bikes to work in her work clothes, even in the summer, I can attest that it is possible to arrive at work on a bike looking presentable. This advice goes for Hye Rim, too, who claimed in an earlier episode that she could not bike and look cute, then she hopped on the back of a guy’s bike. What the hell?! You’re right; this show does make women look incompetent! To Soo Ji’s credit, she did fight off her attacker by herself. She just broke down afterwards. ITA! I used to bike to work too, and unless she is biking up huge hills or something, how can she get that sweaty? Lol. But I guess Soo Ji did fight the guy off, so that is something. Thank you for the recap, I really enjoy reading it.. 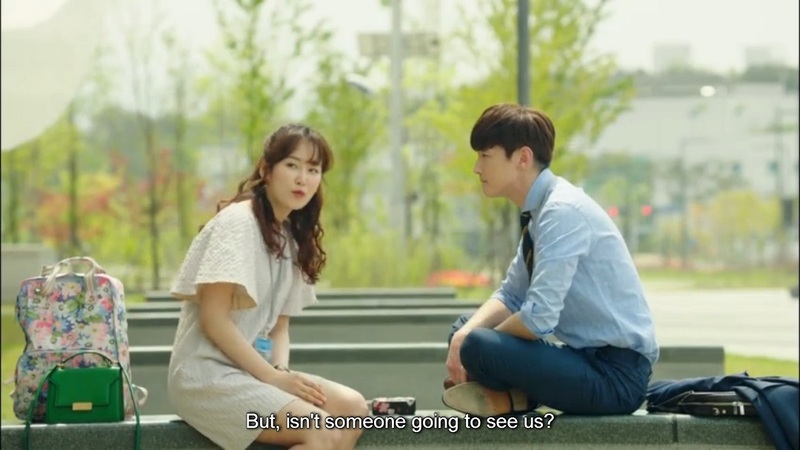 I also find Soo Ji and Dae Young have no romantic chemistry, it’s more to a sibling or best friend chemistry, However, this last episode they seem to force Dae Young to Soo Ji..yet I’m still not convinced enough that Soo Ji should be with Dae Young rather than with Sang Woo.. I just feel like the writer-nim is really bad, they makes us love this sweet couple but then broke them up by using the uncomfortable reason but never give Soo Ji and Sang Woo a chance to have honest relationship..
Actually, I learned the hard way that kimbap spoils VERY easily. I and two of my companions got food poisoning from it my last trip to Korea. 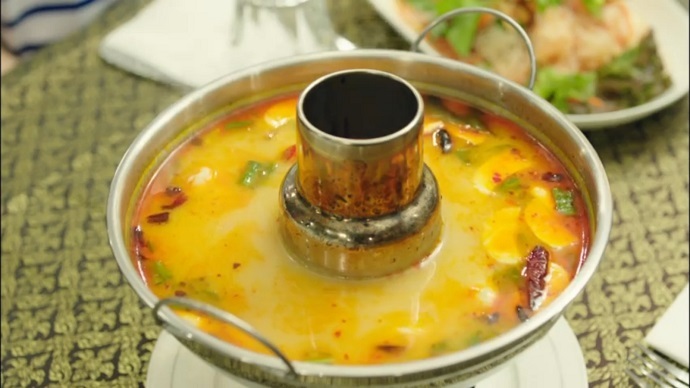 Those screenshots of the Thai food and the kimchi jjigae are making my mouth water all over again. Thanks for the recaps! Thanks for reading. Kimbap spoils? What about those jars of food Jeom Yi is fermenting on the roof of the villa? I think fermented foods keep because the good bacteria keep away the bad, and also because of the very high salt content. I was surprised when I was first told kimbap spoils easily also. I think it’s the banchan filling that comes in contact with the warm rice, especially the meats, that make it spoil. I was also told that native Koreans have a built-in immunity to whatever turns bad in kimbap, it’s mostly the foreigners that get sick, which was true in our case. None of the Koreans we ate with got sick. Thanks! Good to know, if I should ever decide to bike kimbap to a loved one in the middle of summer. anyone know the brand of floral backpack used by soo ji during pack the lunch for sang woo??? please!! !